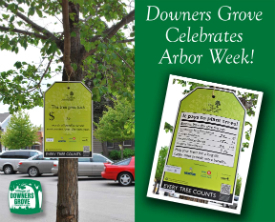 Home » Top Stories » Downers Grove Marks "Arbor Week"
The Village of Downers Grove will participate in recognizing Arbor Week from April 22 (Earth Day) to April 27 (Arbor Day), 2012. The Morton Arboretum, in conjunction with The City of Chicago, suburban communities, Morton Salt Inc., BMO Harris Bank Chicago, and The Davey Tree Experts Company are applying "value tags" on more than 2,000 trees across the region to illustrate the enormous environmental benefits trees provide. The large two-sided 11" X 17" value tags reveal the dollar value of a tree's benefits based on scientific data. Trees are being tagged in Downers Grove, across the suburbs and in the City of Chicago to celebrate and showcase the value trees bring to making the world a greener, healthier and a more beautiful place. The tree value tags will be in place for two weeks. The website www.treebenefits.com simplifies the calculations of carbon reduction, electrical energy savings and property value impact, based on the tree species, size and location. Collectively, for every dollar invested annually in trees (planting, mulching, pruning or watering), the benefits add up to about $2.70. Participating suburban communities include Downers Grove, Glen Ellyn, Glendale Heights, Lisle, Lombard, Naperville and Wheaton.